The Russian news service, Itar-Tass today published satellite photos clearly proving that Malaysian Airlines flight MH17, which crashed in eastern Ukraine on July 17, 2014, was downed by a Kiev-backed jet fighter. The United States and Great Britain have had these photos for months, proving the Kiev junta responsible for purposefully downing the plane and killing 298 passengers and crew, 196 of them from the Netherlands. In fact, for months, the preponderance of evidence has indicated that the downing of MH17 was done by Kiev as an act of false flag terrorism, one of many during the conflict. However, as accusations against Kiev gained substance, the investigation was handed to the Dutch government, who tabled the entire process for over a year without any promise of a definitive finding. All the while, the US was accusing Russia of the attack and threatening retaliation, these photos were in the hands of NATO leaders. “MOSCOW, November 14. /TASS/. Russia’s television Channel One said on Friday it had a photo presumably made by a foreign spy satellite in the last seconds of Malaysia’s MH17 flight over Ukraine. In the ensuing months since the air disaster, the US and its NATO allies have repeatedly claimed that the flight, simply known as MH17, was shot down by first a missile under the control of pro-Russian separatists near Donetsk and then later by Russian forces along the border. The situation was further obfuscated when a Dutch report came out, cleansed of all references as to causality and then later by something even stranger. When reports by radar operators in the region indicated that a Kiev backed fighter had been following MH17, claims were made that all their planes in the area were only low level ground attack aircraft, incapable of high altitude flight. News reports, leaked from Kiev, claimed the only planes in the area were Su-25 ground attack fighters. Later it was leaked that the plane following MH17 was an SU-22 “swing wing.” However, in the interim, dozens of aviation websites were hacked and information on the SU-22 was altered to show it incapable of flight above 21,000 feet and of speeds in excess of 500 miles per hour. The satellite photograph showing the missile being fired at MH17, however, shows the clear outline of an SU-22. A review of the US Air Force report on the SU-22 tells a very different story of its performance. 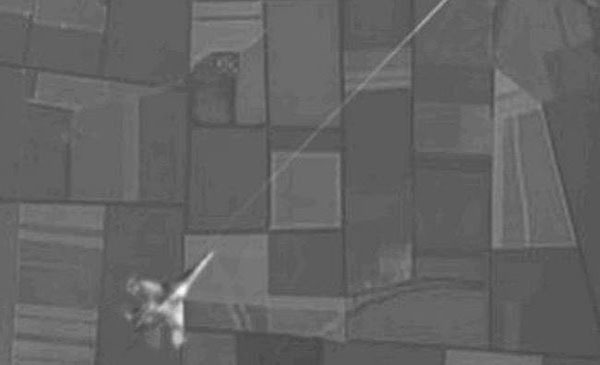 MH17 was flying at 500 miles per hour at 31,000 feet when the SU-22 opened up with 30mm cannon and finished the plane off with an air to air missile into the cockpit, as seen clearly on the satellite photo. “Satellite images Kiev published as ‘proof’ it didn’t deploy anti-aircraft batteries around the MH17 crash site carry altered time-stamps and are from days after the MH17 tragedy, the Russian Defense Ministry has revealed. The images, which Kiev claims were taken by its satellites at the same time as those taken by Russian satellites, are neither Ukrainian nor authentic, according to Moscow’s statement. The Defense Ministry said the images were apparently made by an American KeyHole reconnaissance satellite, because the two Ukrainian satellites currently in orbit, Sich-1 and Sich-2, were not positioned over the part of Ukraine’s Donetsk Region shown in the pictures. Moscow claims weather and lighting conditions in the images were not possible at the dates and times Ukraine claims they were made, the Russian ministry said. Thus far, there has been no response from the US. If, as Andriyevsky asserts, the satellite photos are genuine, it isn’t simply the Kiev junta that is culpable. It was long known that the US had satellite photos and detailed records of AEGIS radar that would have shown exactly what happened. It is now clear why these satellite images were withheld as they failed to support America’s policy of sanctioning Russia on behalf of a regime now clearly guilty of terrorism on a global scale. Moreover, the satellite photos of MH17 are a clear indication that the US also has photos showing the fate of MH370 as well, the Malaysian Airlines Boeing 777 that disappeared from the face of the earth without a trace on March 8, 2014. We can only ask why these are also being withheld and what other agenda, what other half-baked terror plot the fate of MH370 may have served. This appears to be a ‘whole baked’ terror plot if MH370 is added to mix…there are photos of the downed fuselage of ‘MH17’ taken near the door showing a window arrangement that is consistent with MH370, not with MH 17…the base at Diego Garcia was well within MH370 flying range…a lot of this was reported right here at Pakalert…. The is photographic evidence proves the downing of Malaysian MH17 was a deliberate attack on the unmistakably civilian target. By all accounts, this goes beyond an unprovoked act of war to the level of being a war crime. Though there may not yet be evidence of US involvement with the planning and/or execution of the crime , the US was fully complicit by withholding and/or concealing the photographic evidence.If this terrorist attack were carried out by any country other than a US ally, the American government would have already branded them as a state sponsor of terrorism.